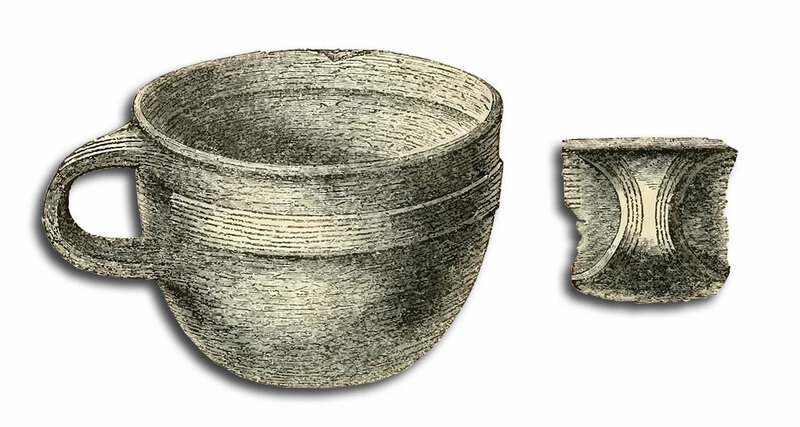 Discover of a Tumulus at Hove, near Brighton, Containing an Amber Cup, &c.
Originally published in Sussex Archaeological Collections, Vol IX (1848). The amber cup found in the Hove Barrow. Drawn by Mr. George De Paris. Westward of Brighton, and extending from the sea-beach to the Downs, is a plain many miles in length, rising with a very gradual slope to the hill tops, and varying in width from one to three miles. It may be said to commence about the centre of Brighton, between which town and the village of Hove have existed till within the last few years, some remarkably level fields devoted to pasturage and the cultivation of grass for hay. Nearly in the centre of one of these fields, that which was the second out of Brighton parish, once stood a small hillock, about fifteen or twenty feet high, on the north of the pathway leading from Brighton to Hove Church, and situated about 100 yards N.N.E. of the new church of St. John the Baptist ; and, till very lately, famous every Good Friday as the resort of hundreds of young persons of both sexes to join in the rustic game of ‘kiss in the ring’. Rising from a dead flat, and being unconnected with any other hills, this hillock always presented the appearance of an artificial mound, and therefore, when, some years ago, a road was cut through it to the Hove station of the Brighton and Portsmouth Railway, I was anxious to learn whether any antiquities had been met with ; but not any were then found. Now, however, all doubt on the subject has been set at rest, and the hillock proved to be a barrow or monumental mound erected over the remains probably of an Ancient British chieftain. In consequence of extensive building operations now going forward in the lower part of the field, labourers have recently been employed removing the earth of this hill for the formation of an ornamental garden in Palmeira Square; and in January last, on reaching the centre of the mound, about two yards east of the road leading to Hove station, and about nine feet below the surface, they struck upon a rude coffin, between six and seven feet long. It was lying nearly east and west, and the boards had the appearance of having been fashioned with a hatchet, as was shown by their impression upon the surrounding clay ; for, on exposure to the atmosphere, they immediately crumbled away, though one of the knots has been fortunately preserved. It proves to be of oak, though one of the labourers, in describing the coffin to me, as we stood on the spot, said it was of elm. Hemispherical in shape, rather deep in proportion to its width, with a ‘lip’ or ‘nick’, and ornamented merely with a band of fine lines running round the outside, about half an inch from the top. 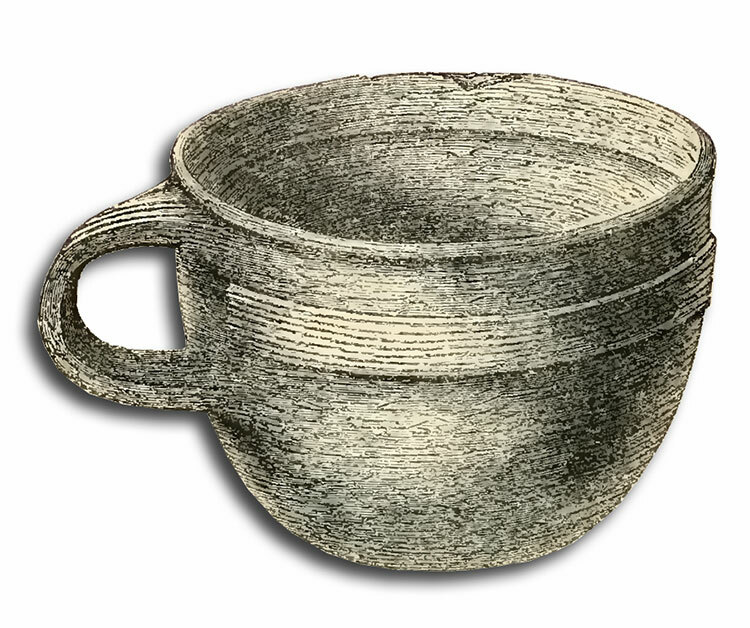 There is one handle, large enough for the insertion of a finger, ornamented with a fillet on each side of the surface, which is flat, similar to that on the cup itself. From the fact of the rim not being perfectly round, and the band before mentioned not passing over the space within the handle, and its being marked off with a line at each end, seemingly cut across, we may conjecture it to have been made and carved by hand. There are two small chips in the rim. That on the left of the handle is fresh, and was caused by the man who found the cup accidentally striking it, as he told me, with his spade, when he first came upon it ; that on the right is not so large, but is ancient, as is shown by its appearance. The cup is perfectly smooth inside and out, excepting where the earth in which it was buried still adheres to the surface ; but since its exhumation the amber has cracked slightly in every part. On the cup being lifted by the handle, this broke into two pieces, having received a blow from the workman’s spade, but fortunately the fragments fit very exactly, and I have therefore easily repaired it. External diameter, 3.5 inches; internal, 3.35 . Height, 2.5 ; depth, 2.4. Internal diameter at and below band, 3. ; width of lip, .125. Distance of band from upper rim of lip, .5 ; width of band of six fillets, .3. Width of handle at upper and lower end, 1.5 in centre,.6. Thickness of handle, .2 ; depth of handle from upper surface of insertion between lip and fillet to surface below, 1.4. Projection of handle from surface of cup to outer surface of handle, .85 ; average thickness of cup, .2. According to these measurements I find, by calculation, that the capacity of the cup is a little more than half a pint. 2. A ‘Celt,’ or head of a battle-axe, made of some sort of ironstone. the centre, apparently serving as a hammer. The ‘celt’ (axe head) found in the Hove Barrow. Drawn by Mr. George De Paris. 3. What I have called a small whetstone. 2.7 inches long ; .6 inch wide in the centre, and .35 inch thick at the centre, tapering off slightly at each extremity. There is a small hole neatly drilled through one end, and the surface appears partially encrusted with some oxide or paint of a red colour. The whetstone found in the Hove Barrow. Drawn by Mr. George De Paris. Very much oxidised, and so brittle that it broke into halves as it was being taken out of the ground. 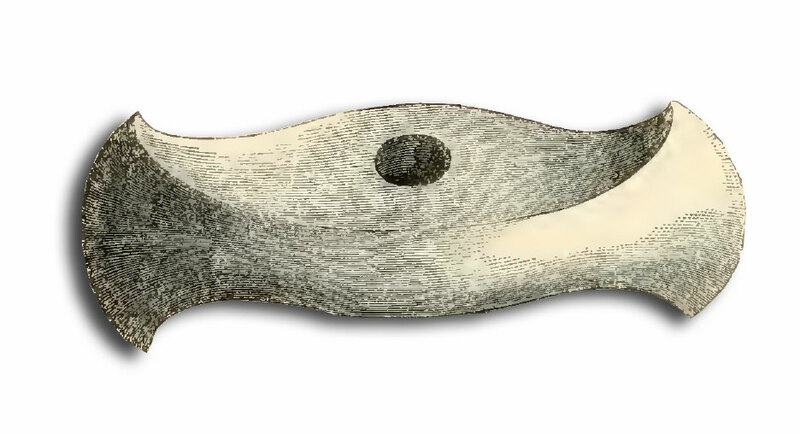 Two of the rivets, and fragments or traces of the bone handle, still remain attached to the lower end of the blade. Dimensions : length, 5.5 inches; width at lower end, 2.4 inches; thickness at ditto, .3 inch. The bronze dagger found in the Hove Barrow. Drawn by Mr. George De Paris. The manner of sepulture, and all the relics, excepting the dagger, show this mound to have been the burial-place of a British chieftain before the time of the Roman invasion. The mound, which was close behind my house, and which I have known from childhood, was nearly circular, perhaps slightly elongated ; and therefore, from its being of the simplest and most ancient form, I am inclined to think we may reckon it to have been at least 2000 years old, perhaps more! It has now disappeared ! The last clod of that earth which so long covered the bones of a British chieftain has been carted away; and coffin, bones, and earth, have been thrown pellmell to form the mould of the rosary of Palmeira Square. I was not present when the discovery was made, but heard of it next day, and immediately commenced inquiries on the spot among the men still working there. From their own mouths, and from Mr. Lainson, clerk of the works to Baron Goldsmid, on whose estate the tumulus stood, I received the information now published. Mr. Lainson states that he was within fifty yards of the place at the time of the ‘find’ that the men immediately sent for him, and that not ten minutes had elapsed from the coffin being disclosed before he was on the spot. The relics had just been taken out of the earth as he came up, and he insisted upon their being given up to him as the property of the Baron. The articles all remained under Mr. Lainson’s care for a few days, when he delivered them up to me, by whom they have been deposited in the Museum of the Royal Brighton Literary and Scientific Institution, where they may now be seen. At my suggestion, application was made to Baron Goldsmid, by the Committee of the’Literary and Scientific Institution, to present them to the Town Museum, which he very handsomely did, merely stipulating that these antiquities should, until the formation of the Town Museum, be placed in the Society’s reading-room, with particulars when and where they were found, and by whom presented. This has been done, and the committee, in accordance with the Baron’s wish, named three persons as trustees to have charge of them – Mr. J. Cordy Burrows, Mr. J. Andrews, and myself. Several small fragments of the broken handle have been submitted by me, in conjunction with Mr. Richard Noakes, of Brighton, to chemical test, and, according to these, proved to be amber. Similar experiments were made by us on other pieces of amber, with the like results. We also boiled some pieces of amber in spirits of turpentine, and found the process rendered them quite plastic while warm, so that the amber could be moulded with the fingers. This may assist our conjectures, how the cup was worked and made, and I am not aware that the experiment of boiling amber has ever been tried before. Perhaps the ancient Scandinavians had some secret by which they could soften it, by holding it over a fire of green pinewood. The drawings of the various articles described were made by Mr. George De Paris, under my direction. P.S. — January, 1857. — On the open down forming the sheep-walk and north part of the farm occupied by Mr.Hardwick, at Hangleton, to the north-west of Brighton, was a little mound, and by its side a slight hollow or depression of the surface. Here Mr. Hard wick recently set some men to work to dig a pond, when they had occasion to remove the mound already mentioned, and in doing so dug out seven human skeletons, all of full size, placed in no particular order. They were about two feet below the turf, having apparently been placed on the ground and covered with the surface-mould and upper chalk taken out of the hollow. Nothing whatever was found with the bones; but several yards away from them was picked up a small Roman coin of brass, misshapen and very much corroded. On the obverse is what seems a head wearing the corona radiata ; on the reverse is a tropceum, with a helmet and military standards. The only letters I can distinguish are V.M., being the concluding part of the inscription. A similar coin had been picked up several weeks previously, near Hangleton Church, thicker than the other, but also much oxidized. On one side is an imperial profile ; on the other, a robed female stretching her right hand over a small altar, and holding something in the left. The only letters I can make out are AVG. However, I have been led to believe that the first is of the time of Germanicus, the second of Valerianus, who reigned from 253 to 260 a.d. The weight of the first is 40 grains; of the second, only 31 grains. The small mound was not a camp, but resembled another about half a mile distant.